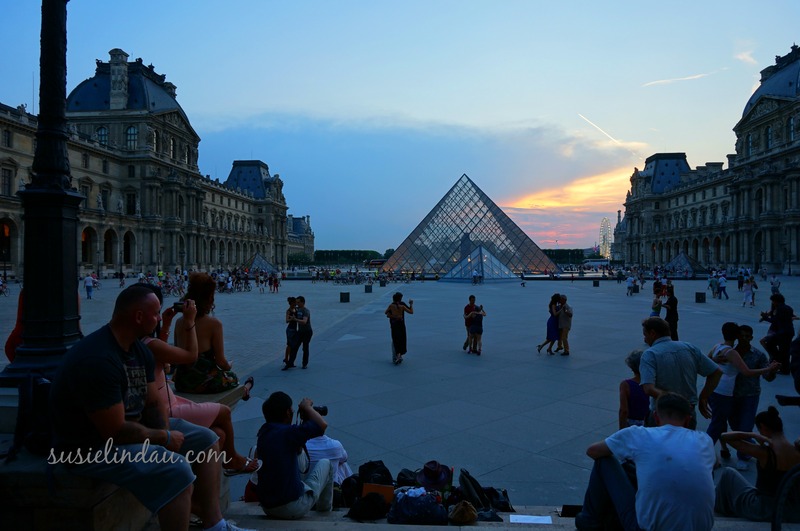 While on a bike tour, we wound through the streets of Paris to the Louvre. The City of Lights compelled us to stop and absorb the magic of the moment. The discord of modern and traditional architecture momentarily blended with the timelessness of dance. Where would you like to travel in 2014? If you haven’t stopped by my blog party, it’ s not too late to Use Me and Abuse Me! I will dance anywhere but particularly in Paris! Nice. I’m afraid the only trips we will be taking in 2014 are to the bank to pay our second mortgage which will be paying for two kids in college! 🙂 If I play my cards right and whine enough, Mr. Brickhouse might send me to PR to stay with my mom for a couple of weeks to escape these frigid temps. Where will you be traveling to, Susie? That sounds wonderful and your mom would love it too! I’m not sure where we are going yet. I am going back to the deep freezer that is Wisconsin next week! Spain, Prague, and Germany are on my list along with many others. We are hoping to get out and travel more this year. I would love to travel to those countries. We loved Spain! Thanks! I used a feature image for this post! It really didn’t go with a ski banner. Or Costa Rica! Better surfing and less people although I’ve heard it has boomed over the last decade. I hope you get to take your dream vacation! I remember touching the Rosetta Stone at the British Museum in London. I had my wife run interference and then I slipped under the rope. That was undoubtedly one of the highlights of my trip. I thought that was a computer program! Hahaha! I will look it up and see how daring you were. No trips in mind for 2014? Wild Riding to Ireland in September 2014 – So EXCITED!!! You will LOVE it! You may not need lodging reservations since there are so many B&B’s. The people and the towns are so charming. I will look forward to your photos! You will love Paris! There is beauty around every corner. Not sure about about the Charles De Gaulle Museum, but the rest is lovely! How romantic to write a novel in the City of Lights! Nice shot! Bike tour sounds like a good idea. Someday I will do this one. Obviously, magic is waiting. Thanks! I would do it again. It was magical! Wait until spring. It’s been a cold winter! I was just back in Wisconsin. It is strange to think how many years have passed. Silly me. Tasmania. A little island state a world apart from mainland Oz 🙂 The years have a way of doing that! I hope you get to travel there! It sounds so exotic!